A few minor corrections and a new category for the CEP Market Survey: Distributed Stream Computing Platforms to cover those platforms that are more distributed micro batch engines rather than near-real-time platforms. These target more the Big Data processing demands associated with workloads like big-scale IOT (Internet Of Things) data handling. Quite possibly these would process data to drive events for streaming CEP engines. Thanks to IBM’s Roger Rea for bringing our attention to the new Google Millwheel, Microsoft Trill and eBay Pulsar projects – will look forward to adding these once we get some more information! 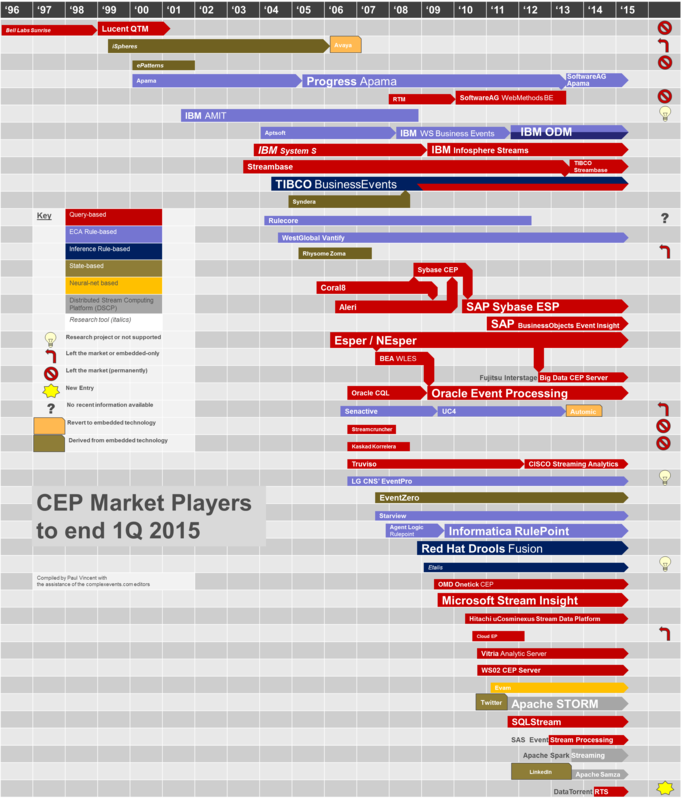 One Response to "CEP tools Market Survey – 1Q 2015"
I think DataTorrent RTS should be DSCP (and not query).